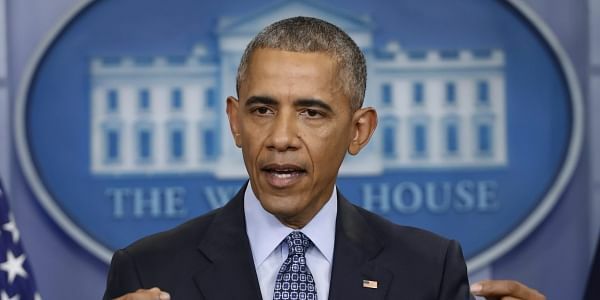 The White House demanded that Congress investigate whether Barack Obama abused his powers in connection with the 2016 presidential election. PALM BEACH: The White House demanded on Sunday that Congress investigate whether former President Barack Obama abused his executive powers in connection with the 2016 presidential election. President Donald Trump levelled that claim on Saturday when he accused his predecessor of tapping telephones at Trump Tower. But Trump offered no supporting evidence, a spokesman for Obama denied the claim as "simply false" and lawmakers in both parties asked for proof. White House press secretary Sean Spicer said in a statement Sunday that reports "concerning potentially politically motivated investigations immediately ahead of the 2016 election are very troubling." "President Donald J. Trump is requesting that as part of their investigation into Russian activity, the congressional intelligence committees exercise their oversight authority to determine whether executive branch investigative powers were abused in 2016," Spicer said. It was unclear what reports Spicer was referring to, and what prompted Trump to make the allegation. Spicer ended the statement by saying that neither the White House nor Trump will comment further "until such oversight is conducted." In a series of morning tweets Saturday, Trump suggested Obama was behind a politically motivated plot to upend his campaign. He compared the alleged events to "Nixon/Watergate" and "McCarthyism!" And he called Obama a "Bad (or sick) guy." The Watergate break-in during the Nixon administration led to President Richard Nixon's resignation and the conviction of several aides. Republican Sen. Joe McCarthy's reckless and unsupported charges of communist infiltration in the federal government during the 1950s gave rise to the term "McCarthyism." After Trump's well-received speech to Congress on Tuesday, the tweets reflected the president's growing frustration with the swirling allegations about his advisers' ties to Russia, which are under FBI investigation, and his team's inability to overcome them. Trump lashed out at his senior team during an Oval Office meeting Friday, according to one White House official. The White House did not respond to questions about what prompted the president's accusations that Obama had tapped his phones. Presidents cannot legally order wiretaps against U.S. citizens. Obtaining wiretaps would require officials at the Justice Department to seek permission from the Foreign Intelligence Surveillance Court, which is shrouded in secrecy. Trump said in the tweets that he had "just found out" the information, though it was unclear whether he was referring to a briefing, a conversation or a media report. The president has in the past tweeted about unsubstantiated and provocative reports he reads on blogs or conservative websites. Trump contended that the wiretapping occurred in October at Trump Tower, the New York skyscraper where he ran his campaign and transition. He also maintains a residence there. Rep. Adam Schiff of California, the senior Democrat on the House Intelligence Committee, said in a statement that Trump was making "the most outlandish and destructive claims without providing a scintilla of evidence to support them." Sen. Ben Sasse, R-Neb., urged Trump to explain what he knows about the wiretapping allegations, "ideally to the full public, and at a bare minimum to the U.S. Senate." Trump has been trailed for months by questions about his campaign's ties to Russia. The questions have been compounded by U.S. intelligence agencies' assessment that Russia interfered with the election to help Trump triumph over Hillary Clinton, along with disclosures about his aides' contacts with a Russian official. Those disclosures have already cost retired Gen., Michael Flynn, his job as national security adviser and prompted calls from Democrats for Attorney General Jeff Sessions to resign. On Thursday, Sessions withdrew from overseeing the FBI probe after acknowledging he did not disclose his campaign-season contacts with Russia's ambassador to the United States when asked during his confirmation proceedings. Sessions, a U.S. senator at the time, was Trump's earliest Senate supporter. The Sessions revelations deepened the president's anger over what he sees as his team's inability to get ahead of the Russia allegations. In the Oval Office meeting Friday shortly before departing for Florida, he angrily told senior advisers that what had the potential to be a good week following his address to Congress had been overtaken by the Russia controversy, according to a White House official who insisted on anonymity in order to discuss the private meeting. The president's allegations may be related to anonymously sourced reports in British media and blogs, and on conservative-leaning U.S. websites, including Breitbart News. Those reports claimed that U.S. officials had obtained a warrant under the Foreign Intelligence Surveillance Act to review contacts between computers at a Russian bank and Trump's New York headquarters. The Associated Press has not confirmed these contacts or the investigation into them. Trump's chief strategist Steve Bannon is a former executive chairman of Breitbart News.